One of the most favorable business opportunities that you can invest on in Maryland is the BBQ and grill cleaning business. It does not entail any high cost of investment even if it means needing to start the business from scratch. You do not even need years of experience in order to put up this business. As long as you are willing to learn from this business, there is enough reason to succeed in the near future. Since The BBQ Cleaner is not a franchise business, you do not have to pay any royalties every month or every year. The potential for earning an income from this business is very large as well since many residents in Maryland request for our services. We need someone like you who can help us reach all of these people whenever possible. You can even choose to work at your own hours and set up service rates accordingly. We will be here behind you to grow your business. The BBQ Cleaner will make sure you have all the tools to grow your business. Why Start a BBQ Cleaning Business in Maryland? Weather is in Your Favor: Most families in Maryland spend their days and nights outdoors grilling their food. Get-togethers are very frequent because of the very mild to hot weather during summers and the mild winters that they have. This will give you a chance to grow your grill cleaning services. Large Customer Base:Maryland is known for hosting an interstate BBQ festival. Apart from this, many homes have their own grills which will definitely love the help they can get from BBQ and grill cleaning services. Very Few Competitors: The market for BBQ and grill cleaning services is not as competitive as other niches in Maryland. With this in mind, you can be sure it is easier to grow your business. Potential for Growth: With all the above-mentioned factors, it will be fairly easy to unleash your business potential for growth. You can even hire more staff or add more vehicles depending on your needs. How Does The BBQ Cleaner Help You Get Started in Maryland? Aside from the all-in-one package which you can make use of to start your BBQ grill and cleaning services, we can also assist you through our on-going lifetime business support at The BBQ Cleaner. This will guarantee that you will be able to grow your business successfully. Since our inception in 2009, we already have more than 180 operators in the country. We are also considered a global leader in the BBQ and grill cleaning industry which means it will be easy to unlock your earning potential through our help. 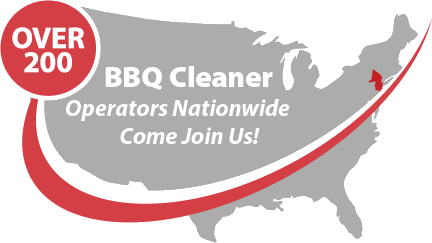 Talk to us today to find out more about this stellar BBQ cleaning business opportunity in Maryland!